This year, my classroom was a "cloud classroom" in that I did my planning, conferring, and grading all online using my iPad instead of carting around various binders with me. This shift made my teaching more efficient, organized, and easier in so many ways. 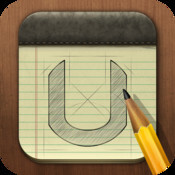 In previous posts, I have talked about how I use the Confer app for conferring ,the online Planbook for planning, and Dropbox, but I haven't yet talked about UPAD. UPAD is an app for the iPad that allows you to save and mark up PDF documents so this is how I access my curriculum documents and article resources. Once you download the UPAD app, you can choose to open documents in UPAD to mark it up and take notes. Once in UPAD, you can read it in "Read-only" mode or "Editable" mode. In "Editable" mode, you can choose your color/width of a pen or highlighter to mark up the text by underlining, writing, highlighting. You can also use post-its and type your notes on the color post-it of your choice and can move the post-it wherever you want on the text. Instead of bringing home my curriculum binders with me to plan at night and on the weekends, I just open the marked up documents on my iPad whenever I need them. You can also create folders on UPAD to organize all of your documents. Since I also work on writing/revising the reading curriculum in our district, I am able to access all of those documents at my fingertips and save them in grade level folders. I also add articles and even online books onto UPAD so I can mark them up with my thinking and notes. I highly recommend purchasing this app if you don't have it yet. It costs $4.99 and is worth every penny. There is a free lite version which is a good option if you want to try it out first before purchasing the full version. The lite version limits how many documents you can save and how many folders you can create so I recommend purchasing the full version for long-term use. Last week, we had three full days of professional development for teachers, including one full day dedicated to a Technology Conference held at the high school. The Technology Conference was organized like an out-of-district conference by offering multiple sessions to choose from that varied from 25 minutes to 2 hours. We received the schedule ahead of time so we could create a "road map" for ourselves of which sessions we wanted to attend. We did not have to sign up in advance for the sessions - they were first come, first serve so the "road maps" helped. The schedule also helped us choose sessions that didn't conflict with sessions we were leading. That was another amazing part of the day - we were learning from one another! Teachers and administrators throughout the district were able to sign up to lead a session/workshop during the day - a great way to share and learn with one another. I led three sessions - iPads for administrators, Best Apps for Education, and Cloud Classroom. In between the sessions I led, I attended three other sessions: Educreations, Wikis for book clubs, and ePortfolios. I was extremely intrigued by the ePortfolio session because I have been longing to move away from the paper version of writing portfolios in the classroom to digital portfolios online. Up until now, I kept procrastinating because ePortfolios were the "unknown", so I made sure I attended this session to dive into this new learning! During this session, Wendy shared how she has her students create digital portfolios by turning their word documents into PDF's by using the Cute PDF option. At first, I was a little confused about how to convert the documents into PDF's, but after having "hands-on" time to explore it myself while being coached by Wendy, it became clear. She then showed us how to insert multiple pages into the PDF so we could continue to add to it throughout the year with multiple documents. This way, instead of having hanging folders that are busting by the seams with papers, it can be organized online in ONE PDF - yay! As I was exploring this new digital tool with Kim, one of my colleagues, we discovered that we can also insert post-its right onto the students writing to add in comments and feedback! We were so excited - it was definitely clear at this point who taught elementary school (high school teachers didn't quite share our excitement over the post-its...ha!). The post-its will enable us to read the students' writing and give immediate feedback to them online. These ePortfolios not only are a great way to organize and showcase student work over the course of a school year, but it is also a powerful way to visually show the progress students make as learners. 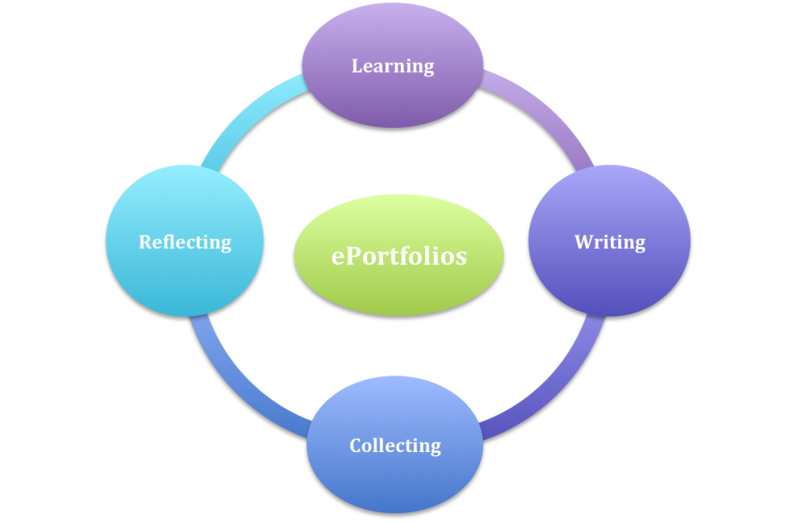 Kim and I are planning on using the digital portfolios for writing workshop next school year and are looking forward to it. There will probably be some bumps along the way as we are trying this for the first time, but that is what learning is all about! I'd love to hear how you are using digital portfolios in your classroom and/or district for writing workshop or any other subjects. Stay tuned for posts throughout the year about our digital portfolio journey! Thank you Joncia and Bryan for making this Technology Conference happen in our school district - it was a powerful day of learning! Thank you as always to Jen and Kellee of Teachmentortexts.com. I ordered Crow by Barbara Wright several weeks ago because Colby Sharp reviewed it on one of his linked posts. What a powerful book on so many levels! Crow is about an African American family living in North Carolina in the late nineteenth century. I have read many historical fiction books about the Civil Rights Movement but not much about the more immediate post-Civil War era. In many ways, this book reminded me of To Kill a Mockingbird by Harper Lee, one of my all-time favorite books to read and re-read. Moses, the main character, has an educated and highly principled father who teaches him about character, democracy, and leadership and a grandmother who was a slave and teaches him about traditions, common sense, culture, and resilience. There are many opportunities for weighty discussions about right vs. right decisions, different types of intelligences, and the importance of independent thinking. I really can't say enough about this book as a lens into a disturbing part of American history and as a springboard to discuss important 21st century values. Moses, his parents, and his amazing grandmother are characters that will stay with me for a long, long time--perhaps even taking seats with Scout, Atticus, and Jem in my literary world. After reading great reviews about The Lions of Little Rock by Kristin Levine on Twitter and blogs, I had to move it up to the top of my TBR pile this weekend - I am so glad I did! This is one of the most powerful historical fiction books I have read this year. It takes place in Little Rock, Arkansas in 1958 during the time when the schools were becoming integrated. The high schools in Little Rock closed their doors to avoid the integration and were not going to open their doors to education until the segregation could continue. During this segregated time, Marlee's middle school is open and she continues to face her own personal struggles of finding a true friend and speaking to others. Marlee has difficultly speaking to anyone other than her family and even has a hard time speaking to her mother. When Marlee meets Liz, she finally understands what it feels like to have a true friend - someone who shares the same interests as you do, respects you, and likes you for who you are. Liz has a positive impact on Marlee's confidence and helps her face her fear of speaking to others. Marlee even gives a presentation at one point to her class which she would have never done before meeting Liz! Unfortunately, their friendship begins to tear apart when Liz doesn't come to school one day and is replaced with the rumor that she was really an African American passing as a white person. Their bond is so strong that they are willing to face danger to keep their friendship going, even if it risks their own safety or the safety of their families. 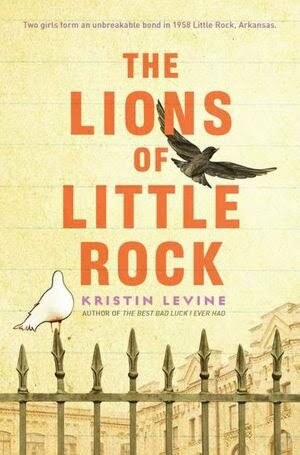 The Lions of Little Rock is a powerful read for students in 5th grade and up as either a read aloud, independent reading, or book club book during a historical fiction unit. Throughout the book, there are many issues the characters deal with: racism, segregation, friendship, power, family loyalty, and many more. It is clear to the reader that some children during this time were much more accepting of others than their parents were and had a different mindset. This book will no doubt spark many rich, deep conversations in classrooms about the time period, historical conflict, characters, and issues. In 5th grade, we have a Historical Fiction Book Club Unit and I know that I will purchase multiple copies of this book for book clubs to read or will read it aloud because it is a book that needs to be read, shared, and talked about. At the end of each year, I pause to reflect on my big take-aways as a teacher and learner as well as have my students reflect on their year. In past years, I sometimes used thinking stems to prompt their reflections or asked them specific questions to reflect upon. This year, I asked my students to write down their "Top Five Take-aways" from the year. When I attend conferences and workshops, I tend to walk away thinking about my "Big Take-aways" so I decided to have my students try out using the same reflection strategy. Throughout the year, I continuously ask my students to reflect on their learning so they were not surprised when I asked them to participate in an end-of-year reflection. Reflection is a critical and necessary component of the learning process and I firmly believe that without reflection, we would not have learning. Creativity and Problem Solving - "This year, I have learned how to solve problems in new and creative ways. I have realized that there is always an answer, and I need to push myself to find the best solution." Teamwork - "This year, I have learned to works as a team and I realize that teamwork involves taking turns and collaborating." Having a Growth Mindset instead of a Fixed Mindset - "I've learned to always have a growth mindset and go the extra distance to reach my goals." "I learned to be more confident and always be up for a challenge." Perseverance - "I learned to never give up and try my hardest." Conversation Skills - "I learned how to have a successful book club conversation and how to get my ideas across." Charts - "Before this year, I can't remember using or creating charts a lot. I have learned how to make charts work for me. Now they help me as a reader and writer." 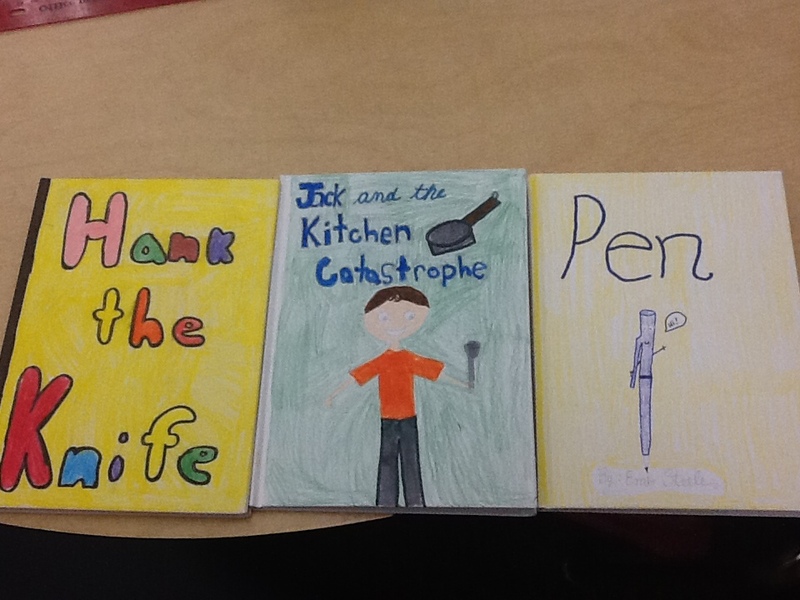 New Book Titles and Recommendations: "Here, in this classroom, I have had the chance to read so many books! I love to read and it was great to have so many choices!" About half of the students in my class wrote about the Growth Mindset concept and how understanding the concept is helping them. I loved seeing this because it shows that they truly internalized the concept that I taught them earlier in the year about Mindset. As educators, it is so important for us to strive to have a Growth Mindset and to understand the difference between mindsets, but I believe it is equally important for students to be aware of and understand the concept. I'd love to hear about other ways you had your students reflect on their year of learning in your classroom. Yesterday our district held a technology conference, so many of us had a chance to share apps, programs, and other instructional strategies. I have so many new apps to buy and install! One of my surprises was that not everyone had heard of the Commoncore app. If you have an iPad and you don't already have it, I highly recommend this free app. While it's not interactive, it is an informational app and it lists all of the Common Core Standards from kindergarten through high school for Math and Language Arts. It also contains a "more resources" component that delineates standards for practice, how a to read the standards, and key design considerations. I already mentioned that it's free! Commoncore is an incredibly useful resource to have at your fingertips. For the last three days, we have had professional development. Three days of professional development at the end of the school year. We said goodbye to our students on Friday, tried to relax over the weekend, and then returned to classrooms on Monday for our own learning. In three days, I have attended workshops on new writing units, on how to develop specific traits of writing, of how to implement and assess our word study program, and on how to align IEPs with the Common Core. I have attended workshops on educational apps, specific electronic reading programs, Smartboard applications, and technology integration. I'm worried that I'm missing some. Since I presented at one of the workshops about productivity apps and Twitter, I also spent time studying and developing a cohesive presentation for attendees. Tomorrow, I will finish the year with conversations and meetings that focus on end of the year learning reflections. If my brain were a muscle, it would need a massage. Please don't hear that as a complaint, though, because as I sit in front of my laptop, I have so many ideas for blog posts that I'm not sure where to begin and I am really excited about all of them. I will definitely write more about the next few days, maybe even tonight, but I want to focus for a moment on a comment I heard a teacher say today during lunch. "I understand how students must feel at the end of the day when they have sat and had information and learning coming at them all day," she said. I need time to process. I need time to play with the information that has come my way and work it into my thinking via my own individualized learning trails and schema. Agendas helped me a lot. I definitely felt more invested and engaged when I had a sense of what was coming next in the presentations. If there was a paper powerpoint to follow along, that was even better. I tend to wiggle. When the workshops were longer than 45 minutes, I found myself changing positions, stretching, doing unobtrusive (I hope) chair push-ups, and even getting up for a not-entirely-necessary bathroom trip or water break. These movements helped me pay better attention. Multi-tasking sometimes focused me more. If I had my iPad or phone, I was still integrating information if I was checking email or even reading over Twitter feeds. When I write--and as I am writing this now-- I can not multi-task, but when I am in lectures, sometimes I feel like my brain needs the extra stimulation to focus more. Conversations and opportunities for collaboration are powerful learning tools for me. The side conversations were valuable for me as a learner and I hope not distracting to the presenters. For any presenter who is reading this, please know that there were many times when my conversations were the off-shoot of the inspiration or positive challenge to my thinking that you provided! I completely appreciate time to unwind and gather my thoughts and I was really grateful that today's technology conference offered opportunities to reflect and regroup. Laughter helped me learn. Learning is intense and finding humor relieved that intensity. Maybe the relief let me go back at the learning--I'm not sure how that works--but I definitely am remembering the learning that combined laughing as I sit here in front of this blog. I will revisit this post in the fall when students return to the classrooms and have information, routines, expectations, and lessons coming at them with full force--I'm actually putting this task on my calendar! I need to remember the feeling of having a brain so full that any additional information will come out my ears. I'm betting that students share many of my experiences from the last three days and I will work hard to remember how exhausting sitting and learning can be. This summer, my goal is to read a book a day - thank you Donalyn Miller for encouraging all of us to set this goal for ourselves through the Book-a-Day challenge! One of the books I read this weekend is a book I normally wouldn't pick up on my own, but after many great reviews from John Schu on Twitter and his blog, I had to buy it and I'm so happy I did. 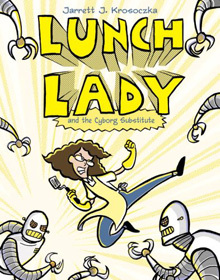 Lunch Lady and the Cyborg Substitute by Jarrett Krosoczka is a graphic novel and the first book in a series. 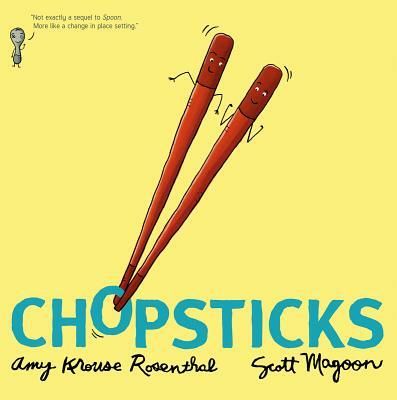 I loved the humor, characters, surprises, and illustrations in this story. Students in the middle grades will love to read this book and I can't wait to buy more books in the series and create a basket of them in my classroom library over the summer ready for September. If you haven't checked out the Lunch Lady graphic novel series yet, check it out this summer. 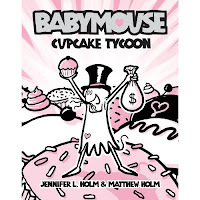 After reading great reviews about the Babymouse graphic novel series, by Jennifer Holm and Matt Holm, on Twitter and in blog posts, I had to read and purchase some of the books. Again, I am so glad I did. I bought about six of them during our last couple weeks of school and the students devoured them! I had to wait until this weekend, when school ended for the students, to read one because I couldn't get my hands on them in the classroom as they rotated through students. I love how each book in the series focuses on a different interest and therefore will pique a variety of students' interest - cupcakes, dragon slayers, halloween costumes, the beach, skating, musicals, science, and the list goes on. 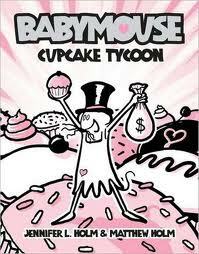 Boys and girls in my classroom all fell in love with Babymouse and even voted it as the Best Graphic Novel series for our Classroom Book Awards. Thank you Colby Sharp, John Schu, and Donalyn Miller for talking about these graphic novels on Twitter during #Titletalk and on your blogs. 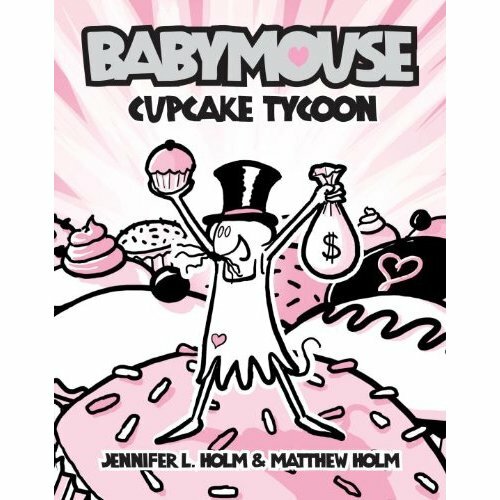 Thank you Jarrett Krosoczka, Jennifer Holm, and Matt Holm for bringing the Lunch Lady and Babymouse into all of our reading lives! At our annual talent show, a group of students teamed up with three students with intellectual disabilities to sing a Justin Bieber song. At the end of "Baby, Baby," the audience of elementary students spontaneously gave these students a standing ovation. I had been in on the planning of the act but the students took all the initiative and responsibility for coordinating and managing rehearsals. The positive response that they received from their community of peers was theirs to enjoy. My emotional tears of pride were maybe just a bonus. One of my professors in my leadership program had us read Catching Up Or Leading the Way by Dr. Yong Zhao. In one of the chapters, Zhao talked about talent shows and he inspired me to think about them differently. Up until reading his points and discussing them with cohorts, I found talent shows to be mostly tedious. 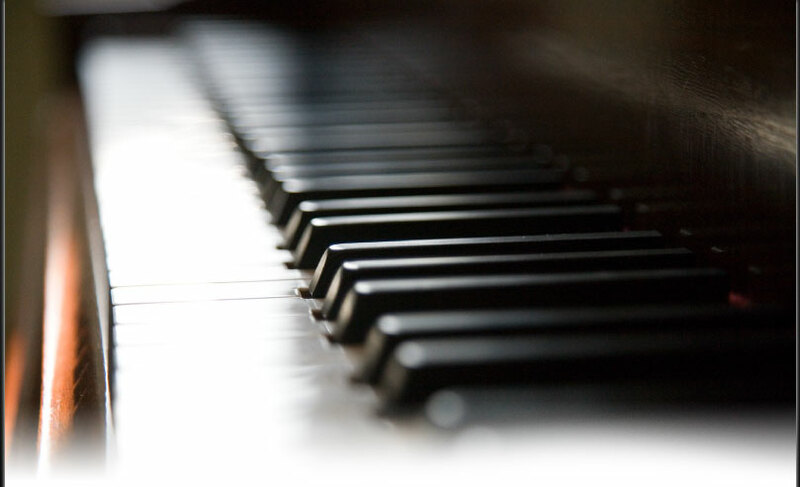 Typically, a couple of students have impressed me with acts that are the results of major commitments; dance routines that have been explicitly choreographed and piano concertos prepared for an outside-of-school recital have been highlights in years past. The Bieber act clearly provided students with an opportunity for powerful inclusion but there were other acts that promoted important skills for students in 21st century schools. For example, a group of girls performed a dance. I am certain that this dance would not win platinum in a competition, but these girls choreographed it, independently practiced it, adjusted for each other’s strengths and weaknesses, and continued their performance even when there was an awkward moment when no one could remember a few measures and moves. From this experience, they developed initiative, resourcefulness, collaboration, perseverance, empathy, innovation, and creativity. Another one of my students had vacillated between wanting to play a piano piece and preferring to remain in the audience. Ultimately, he played. For him, he demonstrated all of the aforementioned skills and a significant amount of courage, too. Do these skills sound familiar? Many of them are at the core of 21st century schools’ updated mission statements. Beyond developing these skills, participation in last week's talent show provided additional opportunities. For one student (and I am sure for others whom I don’t know as well,) the talent show provided inspiration to come to school. Although her absence rate had been exorbitantly high throughout the year, for the two weeks before the show, she was there every day, making every rehearsal. Coincidence? I don’t think so. Additionally, she completed almost all of her work during that time because rehearsals were during recess and she didn’t want to be finishing assignments at those times, a classroom expectation. As a parent and as a teacher, talent shows have seemed long. Sometimes, really long. However, I am finding myself really agreeing with Zhao and even furthering his argument in favor of talent shows because they offer such opportunities for acceptance, risk-taking, and inclusion. Bravo. When I am not in school, one of my favorite ways to use my iPad is to skim through my Flipboard. Flipboard is a free app that feeds news stories into a magazine like format. Without any customization, Flipboard gives snippets of daily news, tech, lifestyle, and photos. While I've dabbled in these areas, I spend most of my time in my own customized Google Reader and Twitter accounts. Over the past year, I have signed up to follow many blogs. Initially, I would get email notifications of new posts. Now, through Flipboard, I am signed up through an RSS feed (found on the blog sites) and the feeds come straight into my electronic reader. Each post has the first few sentences and sometimes a picture so I can skim through and decide what I want to read. If the article interests me, I can link to the original article, mark it as a favorite, email the link, or place it in a "readability" account for perusing. I find this to be an activity similar to reading a journal or a newspaper without the piles of paper. I also have my twitter account fed in through Flipboard and I love the format of the twitter feeds. Instead of just giving the 140 characters, the feeds again include the first few sentences or paragraphs of articles that people I follow have tweeted. Like the Google Reader, I can link to the original article and then have the same options as I listed above. Truly, I can not over-emphasize the amount of professional development I have gotten from using Flipboard. It has won several awards and, in my opinion, deserves every one and more! If you don't already have this app set up on your iPad, you absolutely should install it! 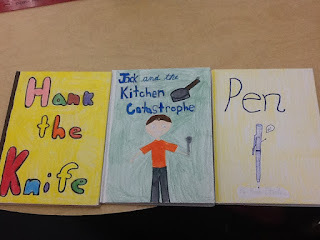 A couple weeks ago, I posted about hosting my first Classroom Book Awards after reading about the idea on Colby Sharp's blog. Last week, the students nominated books for each award category and this week we voted using our ballots. The students were excited to participate in this voting process and couldn't wait to find out the results! This is the last week of school so I tallied up the results yesterday and unveiled the winners. One of my favorite blogs to follow is twowritingteachers.wordpress.com. A few weeks ago, Ruth Ayres posted her own reflection on the end of the year, using the following three thinking stems. Responding to these thinking stems has been on my list since I read her post but I have been distracted by all of the end of the year reports, IEPs and some personal issues. However, I'm addressing these great thinking stems now! I learned so much about adult learners this year. As part of my internship, my principal had me help with the induction of our new teachers. We are a relatively small school so our seven new teachers represented almost every grade level. We met regularly and we developed almost a curriculum for these teachers. Recognizing the amount of information they had to integrate and incorporate into their daily practice was so important as we helped them prioritize, set goals, and assess their own learning. It was amazing to me to watch them grow as teachers, inspiring each other to share and take risks. I was stretched by how to help students write meaningfully. I spent a lot of time thinking about the underlying skill sets of writing compositions of various genres. From there, I created a scaffolded set of isolated skills so that I could effectively teach students and also monitor and assess their progress. Most of my 4th to 6th graders became much more effective at developing topics and incorporating meaningful details or events to support them. Just today, we had a conversation with our sixth graders about the difference between learning to write and writing to learn, such an important place on the learning-to-write continuum. I will continue to stretch my thinking about the process, helping students find their voice and recognize the many purposes of written expression. Writing this blog has helped me (and stretched me!) to think about the learning, insight, and reflection that happens when learners sit and write and I am loving that some of my students are beginning to experience learning from writing. Over the year, I used more and more technology in my daily teaching and I am excited to continue this! One of our end-of-the-year professional development days is entirely devoted to technology and teachers will be selecting various workshops to attend. My iPad has helped my productivity and, while I love being able to access documents electronically, it has also been an engaging and highly effective way to teach and assess reluctant learners. Twitter (another exciting aspect of my year) offers me regular suggestions of new ways to incorporate the iPad and other technology into my practice and this integration will remain a top priority for my professional development. I don't know where to begin what I'm beginning to realize because this statement is at the core of my daily work--I am ALWAYS beginning to realize something within my teaching profession. I think one of the most important responses to this stem is that teaching is coaching at all levels. 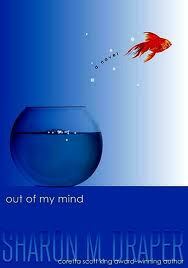 Over the course of the year, I read Opening Minds by Peter Johnston and Mindset by Carol Dweck. Both books emphasize the power of how we approach tasks within our learning processes but they also emphasize the power of language with children and adults. I have been constantly realizing how subtle language is and what strong messages we can unintentionally send. These are books that I will reread often, along with Choice Words by Peter Johnston and the Power of Our Words by Paula Denton. Thank you again to Ruth Ayres for putting these thinking stems out there and compelling me to sit and really think about some of the learning highlights of the year. I admire the simplicity and depth of her statements and encourage anyone making it to the bottom of this post to link to twowritingteachers.wordpress.com and read her post. I also encourage people to spend some time with these thinking stems, revisiting the year's learning. Happy reflecting! Last Wednesday, I was in my glory at BEA (Book Expo of America) in NYC surrounded by new and upcoming books! This was my second time going to BEA and I will continue to go each year. The Javitts Center is filled with high levels of energy and excitement for books! It is a great opportunity to meet authors, learn about new books being released, get books signed by authors, and be around thousands of people that share a passion for books and reading. One of the best parts of the day is coming home from the conference to unload all the new books and lay them out to make my new TBR piles. 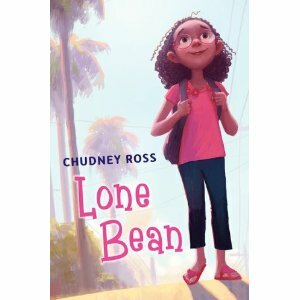 Lone Bean by Chudney Ross is a perfect book for middle grades and kids will fall in love with Bean! Bean is a spunky third grader that will remind readers of Ramona, Clementine, and Marty. I hope that Lone Bean is the first of many books that will be written about Bean! In this story, she is just starting third grade and her best friend has become best friends with someone else over the summer. The lonely lunches and recesses get old fast so she begins to befriend the class bully, Tanisha to have someone to play with. As you can probably expect, Tanisha ends up causing Bean to get into trouble and is not a true friend. Without giving away too much of the story, Bean ends up being faced with decisions and situations that real third graders and kids in the middle grades find themselves in at school. Lone Bean will be published on June 26th and I encourage you to pick it up at the library or book store over the summer to read and enjoy! If you teach in the middle grades, this book is a must for your classroom library! Kids will definitely be able to relate to Bean! 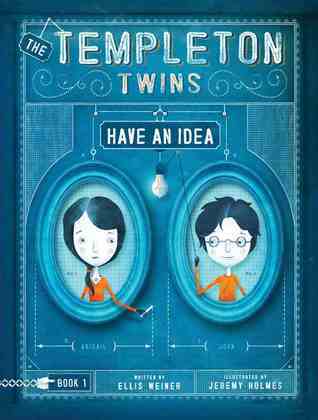 Templeton Twins by Ellis Weiner will make you laugh, especially while the narrator talks to and interacts with the reader during the prologue and throughout the story. This is another great book for middle grades and it is the first book in a series - yay! Visit Jen and Kellee at www.Teachmentortexts.com to read about more books each Monday! As I wrote in an earlier post, at the end of each year, we teach a Choice Unit in writing workshop where students choose an indpendent writing project to work on as writers. This year, I have students working on writing newspapers, magazine articles, picture books, chapter books, and playscripts. 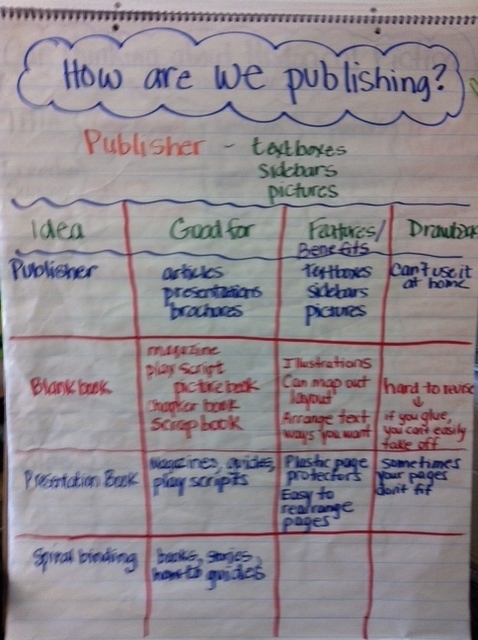 Last week, I taught a minilesson that focused on ways we can publish our writing during this choice unit. Melanie Meehan was in our classroom at this time so she helped create a chart during the minilesson that visually reminds students of the publishing choices that best fit each genre/type of writing. During this minilesson, students had to think about and reflect on their type of writing, audience, and purpose, in order to choose which publication idea best fits their piece of writing. 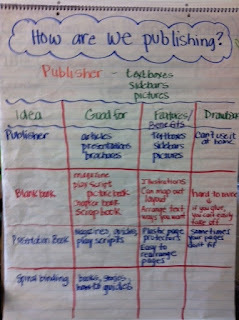 This week, students planned how they would share their published writing with their audience. 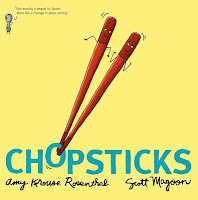 For example, the students writing playscripts for picture book read alouds, are planning to perform one of their plays to our 1st grade book buddies and creating a video of another one to share with the entire 5th grade class in the cafeteria. They are also compiling all of their playscripts into a presentation binder to share with their classmates. 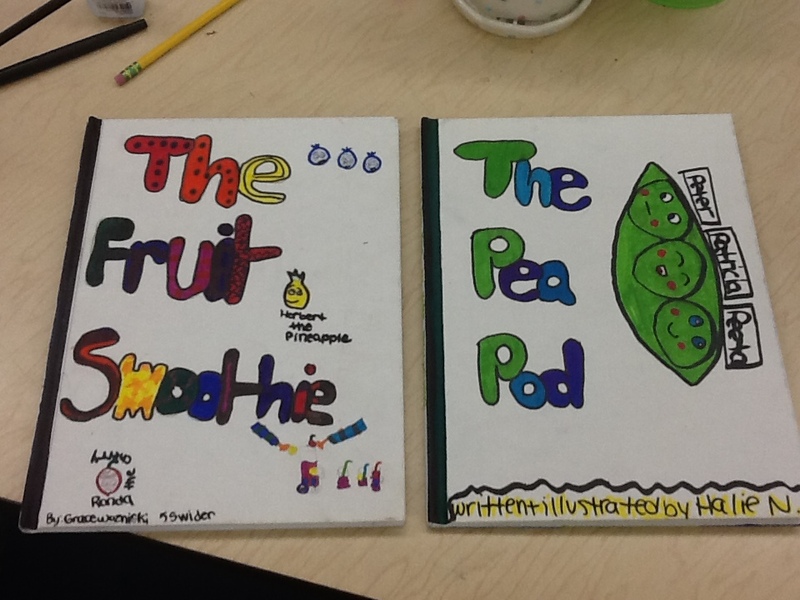 For the students writing picture books, I purchased hardcover bound books for them to use. Last week they started off by planning the layout for their book by deciding which text and illustrations they want on each doublespread page. This week, they worked on gluing the typed text onto the designated pages and illustrating. Next week, they are reading their picture books aloud to our book buddies and other primary grade classrooms - they are so excited to read them aloud to their audiences! Stay tuned for more photos and an update on how they shared their published writing with others! I have been using many of the books that my students have created from Book Creator but I also love many of the interactive books that are available through the app store. I have written about this app before and I still maintain that it is completely worth the $4.99 price tag. While there are many interactive books available for varying price tags, I have found two free ones that I'm highlighting in this post. Toy Story has been one of my favorites! This program has a musical link as well as activities. While some of the adults get a little tired of hearing "You've Got a Friend in Me," the students love it. The program has not only this song, but also features that allow it to read to students, highlight words, and have many of the characters and settings react when touched. I use it as a motivator and also as an engaging fluency tool and comprehension builder. The Princess and the Frog is one more free interactive story that several of my students with disabilities have enjoyed. Again, the program reads it to the user, offering several options for user interaction. There are some activities as well as several instances of character animation. The king in the story teaches a great lesson to his daughter that it's important to keep promises and my students have loved playing and re-playing the conversations! Many of the interactive books have fluctuating price tags and it's worth shopping for them. I have gotten some of them for free by following their sales on Appshopper. If any of you out there in the blogosphere have more free books you are using, please share! 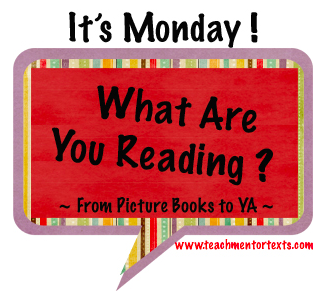 I love the weekly routine of heading over to Teachmentortexts.com and seeing what others are reading. Last week, I read House Held Up By Trees from a previous week recommendation. Thanks to Katherine for that one. 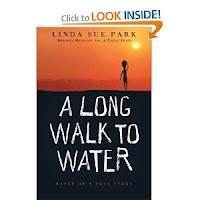 One of my weekend reads was A Long Walk To Water by Linda Sue Parks. It had been on my list for a while and since we are studying historical fiction, I moved it up, although it really is a biography. If you haven't read it, I completely recommend it as an engaging account of the struggles of two young people in Africa. I don't know much about the Sudan and the struggles of the people there so I was shocked to read about the violence through the eyes of an eleven year old boy. Salva was eleven when his school was attacked by rebels and he walked from Sudan to Ethiopia. Eventually, he came to Rochester, New York where he met Linda Sue Park. 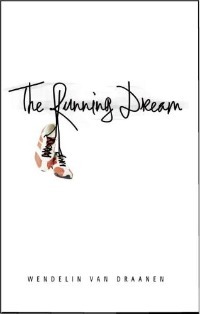 She writes not only Salva's story but also intertwines it another young Sudanese girl's story. 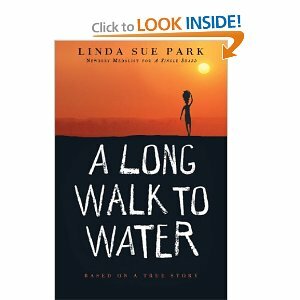 I am definitely adding A Long Walk To Water to my chart of books as one that builds empathy and global awareness. This book may also motivate young people to take action to help others who aren't as fortunate in other parts of the world. What an important book! 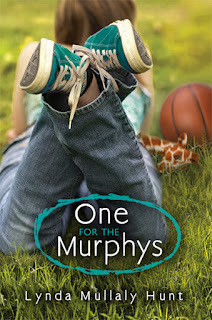 One for the Murphys by Lynda Mullaly Hunt is a must read book! It is in my list of my top favorite books for 2012 without a doubt! It was recently published in May and already has many great reviews written about it on blogs and on Twitter. Once I picked it up to read, I could not put it down because I needed to know what happened to thirteen year old, Carley Connors. Carley Connors reminds me a little of Hollis in Pictures of Hollis Woods by Patricia Reilly Giff. Both Carley and Hollis are forced into the life of foster homes and social workers after a horrible home situation. After being hurt by her new stepfather, Carley is placed in foster care while her mother recovers in the hospital from her own injuries inflicted by her new husband. Without giving too much of the story away, Carley is placed in the Murphy's home. This family never had a foster child, but is a loving family who takes Carley in and treats her like one of their own, helping her heal and giving her the family she never had. At one point in the story, Carley must make the decision whether to return home with her mother and take a chance or stay with the Murphys? At this point in the book, a box of kleenex needs to be nearby because by now you have grown attached to Carley and feel her pain while she makes this life decision. 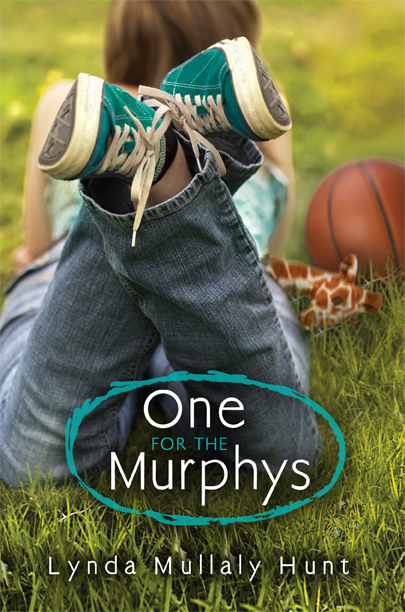 One for the Murphys is a perfect book for middle grades as a read aloud, independent reading, or a book club book. Although this book deals with serious issues around family and abuse, it is written in a completely appropriate way for middle grades. I am currently reading it aloud to my 5th grade class and they are loving it! 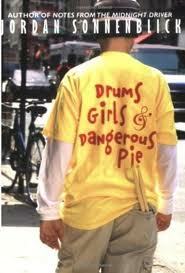 I plan on reading it aloud again next year either during our character unit or our social issues unit. One for the Murphys is such an important book for kids to experience. This book is also exciting for me because the author, Lynda Mullaly Hunt, is a local author here in CT and has been scheduling book visits at local B&N's! Thank you Lynda for bringing this beautifully written story into all of our lives! This is such an important book for kids - thank you Lynda! If you have not had the honor of reading One for the Murphys, move it up to the top of you TBR stack and grab a box of kleenex to have nearby! Enjoy! Our school district offers fifth graders a outdoor education experience and we recently had the much anticipated three day and night excursion to Camp Jewell with the fifth graders. (Full disclaimer: I did not stay overnight so my experience was only partially complete.) This trip is a highlight of the educational experience for most of our students so as I spent time there and as have reflected about it, I have wondered about what we could do differently within our own classroom's walls that would tap into some of the skills and strengths that I emerged and developed in an outdoor setting. "Writing was easier outside," one student said. As a writer, I agree with him that sometimes it is difficult to think of ideas sitting at a desk or table in a room full of people. For me, writing is a personal experience until I'm ready to share and the great outdoors certainly offers more space. Empathy is a skill that I have emphasized this year in my teaching and I think that this concept got through to kids more authentically at Camp Jewell. 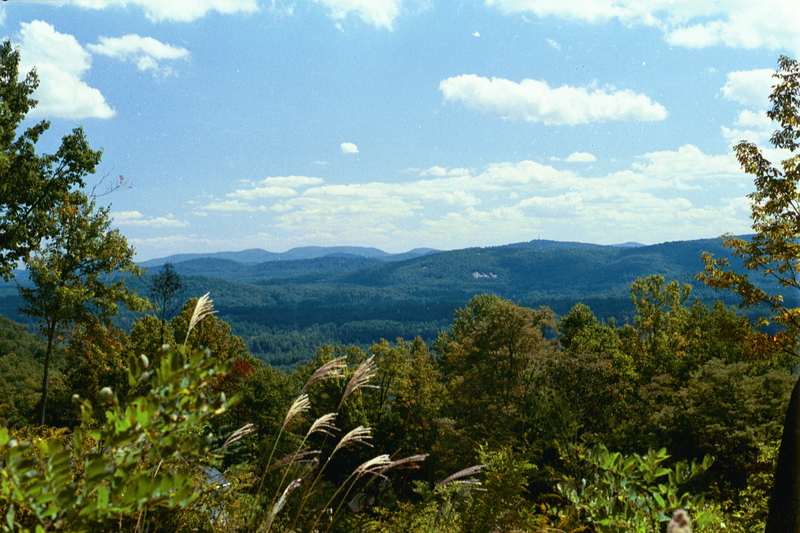 When we climbed the mountain, we talked about how different people would interpret the view. What if they were from Colorado and regularly climbed large mountains? What if they were from a city? What if they were from a desert? How does background experience impact people's interpretations of events. The conversations at the top of Camp Jewell's relatively low peak were much richer and I would love to believe that those conversations could push their thinking in book clubs, read-alouds, and Social Studies--maybe throughout all areas of the curriculum. Throughout the activities, there were opportunities for collaboration and problem solving. Maybe because they were younger, or maybe because they didn't have the pressures of time and achievement, the counselors were better at letting students fail and figure out their own ways to solve problems. I know that I am guilty of helping students before they probably need help. The counselors who ran the program had creative ways to get children's attention whether they were in the dining hall, on a trail, in the middle of a field, or in an outdoor classroom. They used songs, chants, rhythms, and symbols and the children responded. Over the summer, I plan to create a personal repertoire of ways to get children's attentions beyond just a hand in the air. Ga-ga was the free-time activity of choice and if you've never played or seen it, here's a link. http://www.youtube.com/watch?v=sO73MVAkhzw. I would love to get some ga-ga set-ups for the playground as this is a game that is physical, engaging, inclusive and relatively safe. One child and I talked about what the focus of math would be if school existed within a Camp Jewell-like atmosphere. With minimal prompting from me, he listed several authentic project-based learning activities. I can't remember all of his ideas, but some were finding an estimated population of salamanders by how many existed in a small place and multiplying that number by the known similar habitats; calculating different rates of going up and down mountains; and creating graphs of the different speeds various objects and people would take to get down the long slide. Why can't we do more of these sorts of activities within our schools? We don't have salamanders but we have blades of grass and leaves on trees and ants on playgrounds. Who knows what else we could find? What other opportunities exist for real-life applications of math and other subjects that might be so much more engaging for students? What other relevant life lessons can we keep bringing home from a few days in a camp setting with fifth graders? With summer coming, I am going to keep a notebook of learning opportunities that could align with our curriculum and the Common Core, but could also build the sense of purpose, relevance and engagement of this outdoor education experience. Father's Day in the Classroom? As a child growing up, I dreaded the years when we were still in school for Father's Day because I did not have a father. As an only child, growing up with a single mother and living with my grandparents, I accepted the fact that I did not have a father in my life, but my classmates did not. 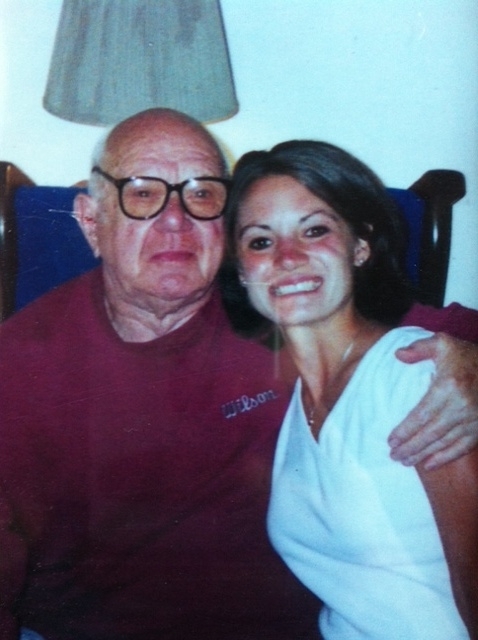 Every Father's Day, I always made my grandfather, Papa Joe, a handmade coupon book card and in my eyes he was better than any father could ever be! 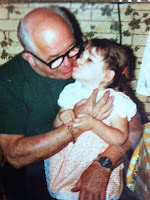 However, in school when my teachers dedicated class time to make gifts for Father's Day, I was teased, questioned, and talked about by my peers as I made a card for my grandfather instead of my father. They repeatedly asked: "Why don't you have a father? Where's your father? Everyone has a father, so where is yours? Why aren't you making that for your father instead? These questions were difficult for me to answer for many reasons: it was an emotional topic for me, I truly didn't understand why my father wasn't a part of my life, and I was hurt that my father didn't want to be a part of my life. 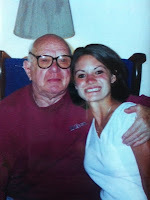 In my eyes and heart, my Papa Joe was my "father" but that wasn't a good enough answer for my classmates. When I became a teacher, I made a promise to myself and to all my future students that I will never celebrate Mother's Day or Father's Day in my classroom because we truly don't know what is going on inside our students' homes or what wounds they may carry with them about family members. Each year, I have students who may have experienced: a parent leaving, a parent passing away, a parent losing parental rights, a parent who chooses not to be a part of their life, and many other situations that I may not even be aware of. In my eyes, we don't have to remind students of these wounds and cause greater pain for them. For people who have had the honor of having both parents actively supportive in their lives, this perspective may not have even crossed your minds about Mother's Day or Father's Day in the classroom. But for someone who lived it, I know what it personally feels like. Each year, I teach my students that the best gift to give is a piece of writing so throughout the year they know that they can choose to give a piece of writing to a family member for a holiday, birthday, or just because they love them. I show my students my box of letters, cards, and writing pieces I wrote for and about my Papa Joe that he saved. This also helps show them the power writing can have on others and how they can give the gift of writing to anyone at any time. As Father's Day approaches this month, please consider this personal perspective as you plan your classroom lessons this year and in the future around these holidays. Thank you Papa Joe for always being there for me!